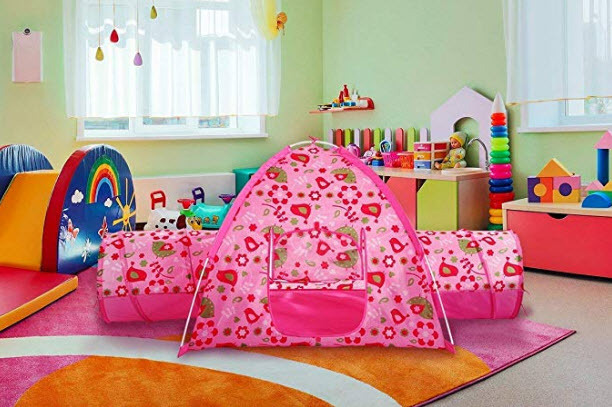 Play Tent & Tunnel are the most amusing and fun play for toddlers and little kids. Kids love to crawl through the enclosed tunnel. The combination of play tent and tunnel supports the kids in healthy recreational activities through their fun play. We have normally seen that kid’s playgrounds mostly have tunnel type slide or tunnel ride, as crawl through tunnel promotes various development skills. Pediatricians suggest for kids to play in colorful tents and tunnels for improving fine motor skills. If you are searching for best kid’s tent and tunnel in Pakistan then you should follow this article and explore the collection of imported quality tents and tunnels for kids in Pakistan. Here you can also find the potential benefits of play tent & tunnel in learning and skill development. Tents & Tunnel play develops psychomotor skills: Kids love to move through the narrow tunnel toy and play within the tent. This activity does not only engage the kids in fun play for hours but also works to improve various psychomotor skills. It promotes the gross motor skills development as kid use the large muscles for crawling. It would be the best kid’s play for proprioceptive input, fine motor skill and sensory skill development, body awareness, and other developmental skills. Tent & Tunnel Play Improves Proprioceptive Senses: Some children have proprioceptive disorder, in which they cannot have strong motor skills. Pediatricians highly recommend the tent and tunnel play for kids, who have such issue. It gradually promotes the synchronization different muscles for balanced movement. It strengthens the overall physical body of kids. Tent & Tunnel Play Improves Cognitive and Social Skills: At the age of toddler, cognitive skill should be supported to grow for broadening the mind. 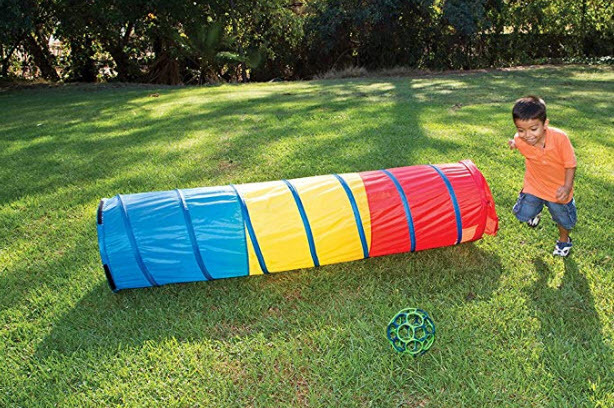 The tent & tunnel play set helps in developing cognitive thinking skills. 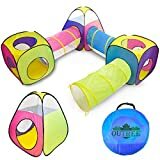 Tent & Tunnel encourages imaginative and cooperative play: Kids love to play within tent & tunnel with their friend so it improves their social skills to communicate. They imagine a storyline and act on it in their cooperative play. It would be the great physical activity for improving the imaginative skills of kids while boosting the self-esteem of little one. 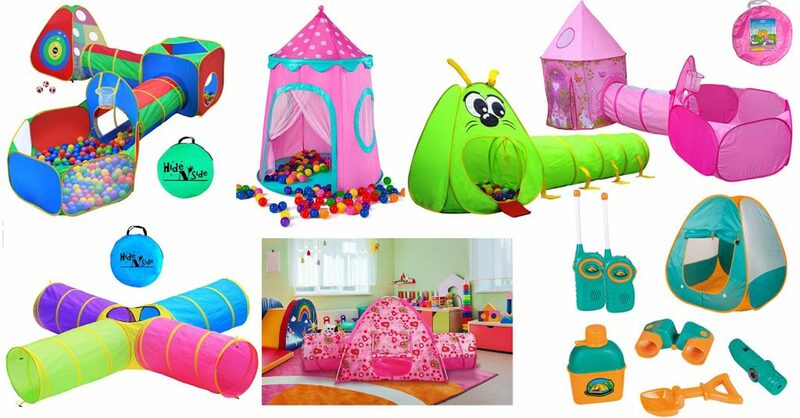 The high quality tent & tunnel playsets come in different sizes, designs, and color. You can also find the separate tent and tunnel for toddlers and kids via the service of Amazon tent & tunnel online shopping in Pakistan. The imported tent and tunnel comes in vibrant colors, which make it visually aesthetic and attract the toddlers and babies. Here we have given few bestselling and top rated tent and tunnel for kids in Pakistan. 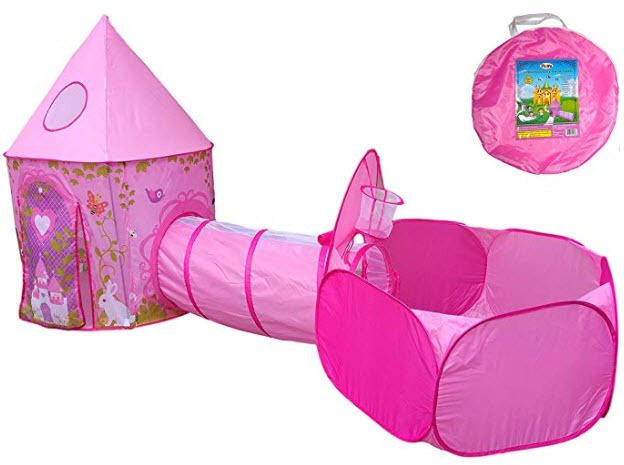 The mini princess castle themed tent and tunnel for kids are ultimate pick for the girls. Little girls love to have the little princess castle of their own. 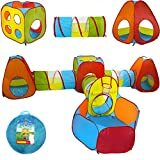 It is 3 in 1 tent playset, which includes play tent, crawl tunnel, and ball pit. It is durable, high quality, lightweight, and safe for kids. Parents should buy it for presenting it in their daughter’s birthday. 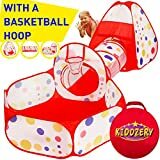 You can find it in the collection of imported kid’s toys in Pakistan via Amazon play tent and tunnel shopping in Pakistan. The 2 tunnels dome design is making it most versatile and stylish play tent for kids and toddlers. It is light in weight and portable in design to you can assemble and arrange it anywhere in your home or lawn. It should be the best indoor tent and tunnel playhouse for kids. You can also remove the tunnel from tent and let the kids use it separately. You will easily find it in the broadest inventory of Amazon imported tent & tunnel playset for kids from online shopping in Pakistan. Pacific play tents and tunnel is featuring multiple colors, durable, high quality fabric, interior paddling, and easy to clean. 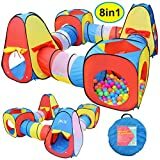 Kids love to crawl from this colorful tunnel and strengthen their muscles and psychomotor skills. It would be the perfect indoor play set for little girls, boys, and toddlers. It is usually found in preschools, in which kids develop their basic motor skills in their fun play. 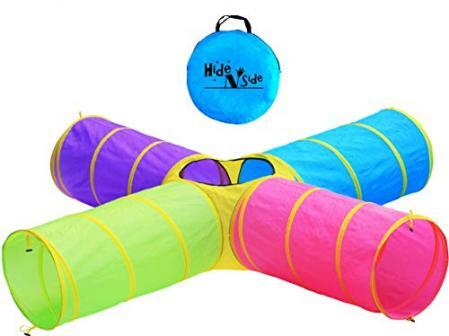 The hide N Side play tunnel has four sided tunnels, which become interesting and fun for kids. It is designed for kids, who have sensory disorder. It would be the effective physical activity for strengthening the basic muscles, joints, and motor skills of kids. It is recommended for the toddlers of age 2 and above. You can buy it from here via placing your order. 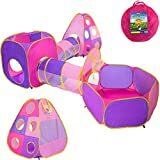 You will find it at affordable price via Amazon kid’s tent and tunnel online shopping in Pakistan. 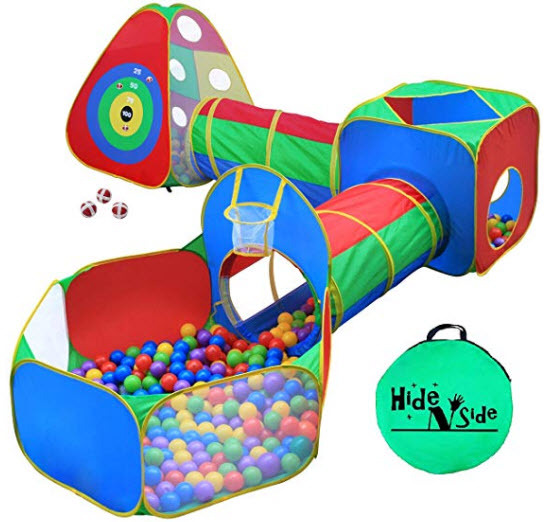 The 3 in 1 design of ball pit tents and tunnels is the ultimate jungle gym for toddlers in Pakistan. 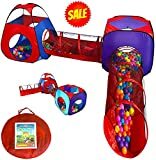 It is composed of a ball pit, 2 tents, and 2 tunnels. It is most enjoyable indoor playhouse for kids, as it allows the kids to play multiple games. It contains basketball hoop, dart wall game, crawl the tunnel play, and more. It is perfect for improving gross motor skills, fine motor skills, sensory skill, and other developmental and learning skills. You can buy the USA imported, high quality, durable, easy to clean, safe for kids, portable and sturdy tents and tunnels for toddlers and kids from here. Pick any of the above mentioned or available in collection of toys for kids in Pakistan, and hit order now. All the ordered toys for kids will be imported from Amazon Pakistan and deliver to you at your home door, with the facility of cash on delivery.